“In those days, a decree went out.”…There it is! 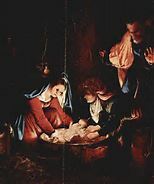 It is probably the best known story of all time and a great story it is–forced occupation, poor couple, long trip, impressive ancestry, a last-minute birth, animals, humble beginnings, angels, assurance, surprise visitors, well-trained angelic choir, and God. (You know, in hindsight, if there had been a coach and a glass slipper, this would have been perfect!) But, seriously, think about it. This story has gripped the world for more than twenty centuries. 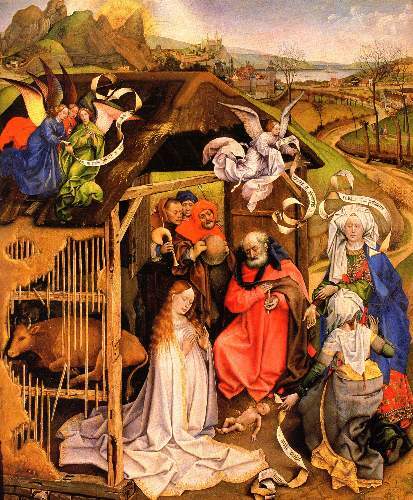 Jesus of Nazareth was born a human gift to this world, born the way we were all born. No, the Scripture doesn’t speak of morning sickness and labor pains. In fact, in our haste to welcome the Christ child into our lives each Christmas Eve, we forget the humanness of the birth. We forget that he first appeared in the dim lights of that grotto drenched with the waters of Creation, with the smell of God still in his breath. We forget that Mary was in tears most of the night as she tried to be strong, entering a realm she had never entered, questioning what the angel nine months before had really convinced her to do. We often sort of over-romanticize it, forgetting that Jesus was human. But that night, that silent night, was the night when the Word came forth, Incarnate. In its simplest form, the Incarnation is the mingling of God with humanity, the mingling of God with us. It is God becoming human and, in turn, giving humanity a part of the Divine. It is the mystery of life that always was coming into all life yet to be. This night, this silent night, was the night that we came to be. In this moment, Humanity and the Divine are somehow suspended together, neither moving forward, both dancing together in this grotto. This is the night for which the world had waited. God has come, sought us out. Eons of God inviting us and claiming us and drawing us in did not do it. So God came, came to show us the sacredness that had been created for us, the holy in the ordinary that we kept missing. God has traversed time and space and the barrier between us and the Divine and as God comes across the line, the line disappears. God is now with us. We just have to open our eyes. And then, the walk began, a walk that is passing through Galilee and, soon, Jerusalem and Golgotha. And at each point, God asks us to dance again. And we will never be the same again. This notion of “Emmanuel”, God With Us, means that all of history has changed. It means that we have changed. Lest we over-romanticize that night as one of beauty and candlelight and “Silent Night”, that night was the night we came to be. We have passed through to another time with our feet still firmly planted here. God is not asking us to be Divine. We are not called to be God. God is asking us to be who God created us to be and came to walk with us to show us what it meant to be human, to be made, not into God, but in the very image of the Divine. Tradition tells us that the birth happened just a few miles from Jerusalem. We think of it as another world. We think of it in the silence without remembering that God came into the midst of a world that is filled with pain and darkness, filled with danger and injustice, filled with the stench of death. We forget that Jesus was born just a short distance way from a place that is called Golgotha with a waiting cross. But God still came. God always comes. God came to show us Light in the darkness and Life in the midst of death. God came to show us how to be. Our journey that we are on now is not separate from that night. That night was the night it began, the night that God, even in the face of the madness of this world, poured the Sacred and the Divine into our lives. We were changed forever. And we can’t separate our past from who we are now. We can’t help but carry the manger with us on this journey and try our best to make room. It is part of us. It is part of when we came to be. It is what sent us on this journey, the journey that leads us to Jerusalem. On this day in this Lenten journey, remember when you came to be. What do you remember about knowing what that means? 2 And it came to pass in those days, that there went out a decree from Caesar Augustus that all the world should be taxed. 2 (And this taxing was first made when Cyrenius was governor of Syria.) 3 And all went to be taxed, every one into his own city. 4 And Joseph also went up from Galilee, out of the city of Nazareth, into Judaea, unto the city of David, which is called Bethlehem; (because he was of the house and lineage of David:) 5 To be taxed with Mary his espoused wife, being great with child. 8 And there were in the same country shepherds abiding in the field, keeping watch over their flock by night. 9 And, lo, the angel of the Lord came upon them, and the glory of the Lord shone round about them: and they were sore afraid. 10 And the angel said unto them, Fear not: for, behold, I bring you good tidings of great joy, which shall be to all people. 11 For unto you is born this day in the city of David a Saviour, which is Christ the Lord. 12 And this shall be a sign unto you; Ye shall find the babe wrapped in swaddling clothes, lying in a manger. 13 And suddenly there was with the angel a multitude of the heavenly host praising God, and saying, 14 Glory to God in the highest, and on earth peace, good will toward men. This is the time for which we have waited. This is the time that makes the world stop, if only for a moment, and say a prayer for peace and light our candle and gather around our Savior. This is the night that we keep and ponder. Mary and Joseph did not know that first Christmas what their lives would hold. They knew the child that lay in that manger was special, even holy. But it would take time for them to understand and grasp that this tiny child that lay there was God coming into the world. And those Shepherds, out, minding their own business, tending to their flock—what would you have thought when the very glory of the Lord came around? Fear not..ugh oh, we’ve heard that before. That can’t be good. That means that the floor of your life will give way until you can no longer stand where you are. That means that you have to leave the place where you are and begin to journey far. That means that nothing, nothing will ever be the same again. We cannot live in this manger. Jesus will not be there. So, yes, we have to ponder for a bit. After all, changing life courses is not something to be taken lightly. But soon the child will grow and become what God intends. We must do the same, following Christ into the darkness by the light of a star that will remain with us always—as long as we don’t go back and leave it behind. The people who have walked in darkness have, yes, finally seen a great light. And as we walk, we open our hands to receive what God has in store. The journey ahead will not be easy. It is not for the faint of heart or those that think they can do it by themselves. It is for those that hunger and thirst in the deepest part of their being for the very presence of God. Eat this bread! Drink this cup! Jesus Christ is born today! Christ is born! God is come! And nothing will ever be the same. Thanks be to God! FOR TODAY: Let us go and see this thing that has happened. And I remember that long journey to Bethlehem. It was uncomfortable. It was scary. It was lonely. We were traveling with others but it seemed to be just Joseph and me. Perhaps it was because we were the only ones there that knew. And, yet, we didn’t know. We thought we would find appropriate lodging. We thought that perhaps there would be a lovely older woman there that could talk me through the birth. We imagined that we would have a place that was warm and comfortable. But that was not to be. The city had filled to capacity. There was just no room. I have always thought of that night and wondered if it was the way God intended. Did God mean to come in virtually unnoticed through a back door of the world in the darkest of alleys? What was the point if no one noticed? Or was this God’s way of testing us to see if the world was open enough to receive the Christ? I’m not usually in to believing that God tests us. I think God came into the world just like we all do—as an innocent baby who needed to be held and loved and welcomed into the world. But the world was moving much too fast as it often does. The world was not prepared. The world was not ready to change. I now understand that God did not come because the world was ready. God came because the world needed God. God came because it was time. The world needed to be saved not just from the evils surrounding it but from itself. The world needed to be awakened. The world needed to be reminded who it was. So, into the darkest and most foreboding part of the world, God came. And the baby that I held was indeed the very Saving Grace of the world. The baby that I held that day was not the One who would make our lives easier or clean up our world. He would not stop wars or stamp out poverty. He would not bring us together as one world. The baby that I held that night was the One that would show us the way to God and that on that journey, we would be called to bring Light into the darkness over and over again. Lift up your heads, ye mighty gates; behold, the King of glory waits; the King of Kings is drawing near; the Savior of the world is here! Fling wide the portals of your heart; make it a temple, set apart from earthly use for heaven’s employ, adorned with prayer and love and joy. Redeemer come, with us abide; our hearts to thee we open wide; let us thy inner presence feel; thy grace and love in us reveal. Mary and Joseph have arrived. The crowds are almost too much to take, pushing and crushing as the couple makes their way through them. Mary doesn’t feel well. She really needs to just lie down and rest. And when you don’t feel well, the last place you want to be is somewhere that is not home, somewhere foreign, somewhere so crowded, so unwelcoming. They need to hurry. There is not too much time left. They stop at a small inn up on the hill overlooking the shepherds’ pastures down below. Joseph leaves Mary for a moment and goes to make arrangements for a place to stay. But when he returns, his face looks frustrated, almost in tears. He tells Mary that the inn is full. In fact, the whole town is full. There is no place to stay. There is no room. But he tells Mary that the innkeeper has given them permission to at least go into the stableroom to keep warm. He’s freshening the hay now. He actually was very nice and was trying his best to make them comfortable. So Mary and Joseph entered the stableroom and, surrounded by animals, tried to get some rest. They could still hear the crowded city outside. They could hear the Roman guards yelling as they tried to control the crowds. It made the place feel every more foreign, even more foreboding. But directly overhead, was the brightest star they had ever seen. It was as if the tiny little stable was being bathed in light. So Mary laid down and closed her eyes. She knew that the time was almost here. She knew that the baby was coming into the world. And on this night of nights, into a cold, dirty stable in a small town filled with yelling and pushing crowds, into a place occupied by soldiers, into a place that did not feel like home, into a world that had no room, God comes. The door to the Divine swings open and God and all of heaven burst into our little world, flooding it with Light and Life. And yet, the child in the manger bathed in light, the very Incarnation of the Divine, Emmanuel, God With Us, the Messiah, is, still, one of us. God takes the form of one of us–just an ordinary human–a human like you and me–to show us what it means to be one of us, to be human, to be made in the image of God. God comes into a world that is unprepared for God, that has no room for God. God comes into places that are unclean, unworthy, unacceptable for us, much less for the Divine. God comes into places that most of us would not go, out of fear of the other, out of fear of the unknown, out of fear of the darkness. And there God makes a home. The Divine begins to pour into the world and with it a vision of the world pouring into the Divine. This night, though, is not the pinnacle of our lives but, rather, the beginning of a new chapter. God comes, bathed in Light, in the humblest of disguises imaginable, into the lowliest of places we know, into the darkest night of the soul, that we might finally know that all of the world is of God, all of the world is bathed in the Divine. God comes so that we might finally see life as we are called to see it and live life as we are called to live it, filled with mercy and compassion and awareness of our connectedness to all the world. God comes so that we might finally be human, so that we might finally make room. Perhaps the world will never be completely ready for God. If God waited for us to be completely prepared, God would never come at all. But this God doesn’t need our preparation. This God doesn’t need to come into a place that is cleaned up and sanitized for God. Instead, God comes when and where God comes. God comes into godforsakenness, into a world that is occupied by foreignness, where the need for God is the greatest, into a world that cries out for justice and peace, and there God makes a home. God comes into the darkness and bathes it in light. The time is here. In this moment, the door to the Divine swings open and God and all of heaven are now bursting into the world. If you stop and listen, just for a moment, you can hear the harps eternal in the distance as they approach our lives. Can’t you feel it? Doors opening, light flooding in, the earth filled with a new vision of hope and peace. Maybe, just maybe, tonight will be different. Maybe this is the night that the world chooses peace and justice and love. Maybe this is the night that the world takes joy. Maybe this is the night when the world realizes that it is already filled with the Divine. Maybe this is the night when we become human. Maybe this is the night that we make room. The Gospel writers all seemed to struggle a bit to fully convey the wonder, the unfathomable glory, of this night. In fact, the writer that we know as Mark didn’t even really try. He or she just jumped right in proclaiming the Good News, seemingly in a tremendous hurry to get the word out. For the writer of Matthew’s Gospel, he seemed to only be able to state it with some proof of what it was not. (In other words, this is no ordinary birth.) And the writer that we call Luke seemed very focused on the physical place of Jesus’ birth and the realization that there really was no room. But years later, the writer of John’s Gospel, conveyed a notion with which we still struggle: that God in God’s wisdom after centuries upon centuries of trying to deal with humanity, after years of drawing us toward the Divine, of showing us a vision that God has for each of us, became flesh, one of us. On this night, God is born human, fully human, into a world that was never really ready, never really prepared (and probably still isn’t). And, yet, God must have loved the world, even THIS world, more than life itself, to come into it as one of us. God became human and lived with us. Incredible thought, isn’t it? The Incarnation is God’s unveiling, God’s coming out of the darkness and the shadows and the clouds and showing us for the first time what we could not see before. Emmanuel, God With Us, this day walks into our ordinariness. God has traversed time and space and all things Divine to enter our every day world. Pierre Teilhard de Chardin said that “by virtue of the creation, and still more of the incarnation, nothing here below is profane for those who know how to see.” Perhaps God came into this ordinary world to show us the holiness that had been created, the sacredness that in our worldliness, we were somehow missing. God steps into our lives to show us the depths to which we have not allowed ourselves to dig. No longer can flesh and humanity be deemed “bad”; God came as flesh, came as human, came as one of us. It would be easy to dismiss the whole thing as something that “seemed” like one of us because, after all, this is God. And what would God be doing fooling around with the squalor and feebleness of this world? You see, it is not that God lowered the Godself to our standard but that God’s coming raised us toward the Divine. And notice in the Christmas stories how they emphasize the lowliness of the surroundings and the danger to the child as much as the miraculous glory of the event. By entering human existence, even God faces down the power of evil, sin, and death. In love, God elects to be no more immune than we are from the dangers to love and life. Thomas Merton once said that “the Advent mystery is the beginning of the end in all of us that is not yet Christ.” It is all this waiting, all this preparing that we have done that has put us in this place. It is the place that humbles and amazes at once. Who would have ever thought? Who would have ever written the story such that a baby’s birth on a cold desert night in the midst of social turmoil would be the in-breaking of the Godself into our world, Emmanuel, God With Us. After all this time, all this waiting for God, this hoping against hope that God would show up and pull us out of the mire of humanity, God comes full on into it, not pretending to be like us but becoming one of us. God came to show us how to be who we are, who we are called to be, and to show us that, once again, it is very, very good. So, on this night of nights, as the Light begins to dawn and we realize that God has come bursting into our lives and into our world, let us open our eyes and rub the sleep out of them and finally see this thing that has happened. Reflection: On this night of nights, what does God in our midst mean for you? How can this year be different? There is a word that we do not use much called “liminality”. It is from the Latin word for threshold and is used to describe a state of being “betwixt and between”a point of being suspended between what has happened and what will be. It is likened to being on an airplane flying over the ocean between two continents. For a few hours, it is as if you are suspended between times, cultures, and nations. It is as if you are nowhere and everywhere at the same time. It is a place of enlarged vision, enlarged perspective and no real place to put down roots. Liminality is a place that our souls crave, a place where our spiritual sense is somehow heightened, a place where se can see both who we are and who we will become. On this eve of the Great Eve, we find ourselves a little “betwixt and between”. Think of this day so long ago. 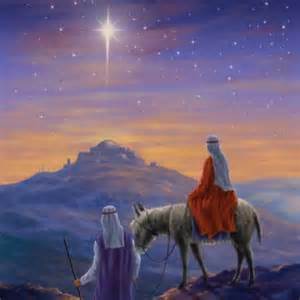 Bethlehem was in reach for this scared young couple who were so unsure of exactly what the world held for them. They were rounding the final peaks of their journey. But this day they found themselves no longer a part of their old lives and yet they didn’t really know what tomorrow would hold. But now, now they were traveling through a foreign land. It was the land of Joseph’s family. He had been there often as a child. But the place was different somehow, full of those who followed this emperor, nothing like he really remembered. The road was packed with travelers returning to the place of their ancestors to make their presence known to the government. Joseph felt like he should know these people and, yet, they were all strangers to him. Mary and Joseph did not feel like they were part of this new world and yet their old world did not exist. There didn’t seem to be any room for them at all. We are indeed standing on the edge of a brave new world. Oh sure, we do this once a year whether we’re ready or not. Once a year, the night of nights comes and we sing Silent Night and we light our candle and once again welcome the Christ Child into our lives. Why is this year any different? Because, in this moment, standing on this edge between who we are and who we will be has the possibility of changing everything. This is the moment when we decide whether or not to turn toward Bethlehem or to turn and go back. Standing in this place of “betwixt and between”, we see both, fully in our view. We are not that different from that scared young couple. We find ourselves pulled between the life we’ve so carefully created and the life we’ve been promised. It is hard to not hold so tightly to those structures that give us power and prestige and security. And yet, God doesn’t call us to leave our lives behind but to live all that we are and all that we have within that vision that God holds for us. And it is in this moment, standing here between the two that allows us to see how to do that, that allows us to see our lives the way that God sees them and journey on. It is in this moment that God gives us new eyes and asks us to follow the star. And if we do that, this year WILL be different. We are standing in the threshold between a waiting world and one in which the Divine has already poured into our midst. We live in the already and the not yet. But for those who see with new eyes, the road ahead is the only one that makes sense anymore. Because that is the way to Bethlehem. Let us go and see this thing that has happened. There’s a world about to be born. Reflection: On this eve of Eve’s, name those things that are holding you back from THIS year being different.